Here are the votes cited by Coffman in his news release. If you remove these, Coffman voted with Trump 95 percent of the time, not 96 percent. Good Mike. Let the butthurt flow through you. A toady for the toadstool. The "Standing Up to Trump" image builds itself. a "standing coffman" image at 4 degrees to a 90 degree depiction of Trump. Coffman scarcely is off full horizontal, no matter how you do the math. We live in a parallel universe were a Republican congressman stomps his feet to emphasize how much the doesn’t support a Republican President. So sad. No, what's sad is that after he theatrically renounces the President to one audience, he then whispers, "J/K, y'all", to another. Clear disconnect between "What I say" and "What I do". 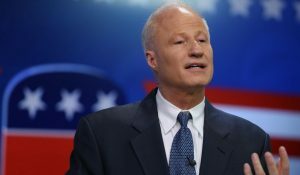 But then, Mike Coffman is just not conservative enough and caters to minorities too much. Plus, he’s stayed too long. Or so I heard. Hey, Pear, how's the new dog coming? Our new dachshund Tuppence is slowly taking her place as co-ruler of the household along side my son-in-law's terrier Penny. We are heartbroken. Percy is my Champion Springer. We took him in for dental cleaning and the blood labs they do came back he is in kidney failure. Nothing can be done. Not sure how long he will be with us, weeks or months. So sad! Nobody "owns" something as wonderful as a dog, which is only a loan from god. This is terrible news. Treasure whatever hours you have left with him and understand that the pain of parting is the final measure of the joy he gave you. I am so sorry, my friend. Powerful Pear — so sorry. Kidney failure is a secret killer that has taken a couple of my favorite working dogs that I knew. Hope you will enjoy the sunny days left with Percy. Sorry Pear. I'm a cat person but your furry kid is the same no matter what. We had to let our little girl go back in February and I still miss her.